One of the best plants for any indoor situation are the African Violets, easy care, they take up little space, great foliage and beautiful flowers. They grow naturally in the mountains of South Africa, in shaded areas along rocky ledges and were first brought to Europe by Baron Walter von Saint Paul. The mountains are the Usambara mountains, howvwer they were named after the Baron, rather than the mountains. Fantastic flowers, great foliage and actually African Violets (saintpaulia species) are fairly easy to grow and care for once you understand the basics. African Violets have been a favourite indoor plant for many years. Great textural foliage and fantastic flowers that appear for mush of the year from the many hybrid species available just remember that they actually are not Violets at all. 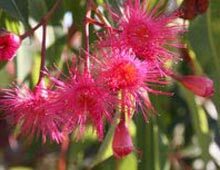 And with a little care, and the right conditions, the flowering season is all year long. You can buy specialist pots, soils and fertilizers, even indoor lights for African Violets, however simple techniques will usually give great results. So with a little care you to can grow African Violets such as the 'Geneva Edged' example pictured right. 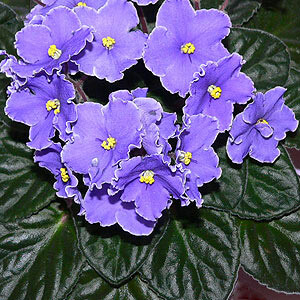 Saintpaulia ionantha is the species from which most African violets originate. These are a low growing and low light requirement plant, in terms of growing Mediums (soil), African Violets prefer a humus rich soil that is free draining you will find many specialist African Violets potting mix, or potting soils available at better garden centres. Once established, African Violets like to be repotted every 6 - 12 months. Use a specialist African Violet potting mix or a mixture of 1 part perlite, 1 part peat moss and 1 part vermiculite. If you have a ph meter look for a ph of 6.5 . African Violets like to be in small pots, they prefer a pot that is narrower than the actual plant itself. They also prefer short pots,not tall ones. Specialist potting mix should always be used so that drainage is correct. If you have a ph meter then look for a ph of around 6.5. Remember to remove old spent flowers as this helps with re flowering and they will re flower for 6 - 9 months with proper care. African Violets are watered from below, place water in the saucer below the pots and allow the plant to take up moisture. Watering from above is best carried out using a specialist watering can that has a long spout that can reach beneath the leaves. Avoid watering the leaves of African violets. Use water that is at room temperature. Water when the top layer of the potting mix feels dry to the touch. After watering empty the saucer beneath the pot. Wick Watering is the best way to water these plants, you can buy specialist pots of simply use some acrylic wool. You will need some wool around 15cm long, a water reservoir that the pot of violets can sit on, and of course the pot of violets. Best done when repotting, just push the wool through the bottom of the pot and wind it around in the lower part of the potting mix. Repot the African violet on top of this. Make sure you have enough wool to reach down into the container you will use as a reservoir. You can then water by topping up the reservoir, the wick does the watering. African violets do best in indirect or filtered light. 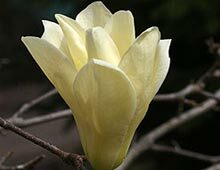 If the plants receive to much light the leaves will tend to yellow or lighten. To little light causes thin leaves and growth that tends to 'reach for light'. 8 - 10 hours of light a day is recommended. Artificial light may be used if required. 1000 foot candles is a recommended measurement by many growers. Specialist African Violet fertilizers are the best way to feed your african violets. Mix liquid fertilizers in advance so that any chorine has the time to disappear and the water gets to room temperature. Leaf cuttings taken in the spring time are the easiest way to propagate African Violets. A propagation mix of 1 part sand to 1 part vermiculate is suitable. Insert the stem of the leaf into the mix and and water well. Roots should appear in 4 - 5 weeks. Pot up when the new plants have at least three leaves. Generally fairly disease free if kept in a room with good airflow and you keep humidity to around 60%. African Violets can be subject to Powdery Mildew and also thrips and mites. 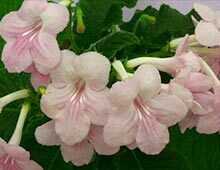 Thrips and Mites on African Violets can be treated with an insecticidal soap spray, Powdery Mildew is best treated with a proprietary fungicide. African Violets not flowering ! Often this is simply through lack of light, although they do cope with low light and grow indoors, they need enough light to flower. If they are in a position where they casy a distinct shadow, then they have enough light. A second reason for not flowering is through the use of a fertilizer that is to high in nitrogen, this encourages leaf growth instead of flowers. What about other indoor plants?